More than a year before the United States entered World War II, the Montana National Guard was inducted into the regular Army. The Montana men formed the backbone of the 163rd Infantry Regiment of the 41st Division. They were stationed at Fort Lewis, Wash. When the Japanese attacked Pearl Harbor, and they were immediately dispatched to guard the Olympic Peninsula beaches from Japanese invasion. In March 1942, the men of the 41st Division boarded the luxury liner Queen Elizabeth for the long trip to Australia, becoming some of the first American troops deployed overseas during the war. Because of the strict censorship rules in effect, few Montanans knew where the National Guardsmen had gone until a letter from an Australian citizen appeared in Montana newspapers, praising the good conduct of the Montana National Guardsmen, and claiming that “a finer lot of well-behaved young men never represented any country.” After months of training in Australia, the 41st Division celebrated Christmas of 1942 aboard a troop ship bound for New Guinea. The men from Montana were about to see their first combat in the malarial jungles of New Guinea. They were headed for the northern coast of Papua, and the final stages of the bloody Buna-Gona campaign. 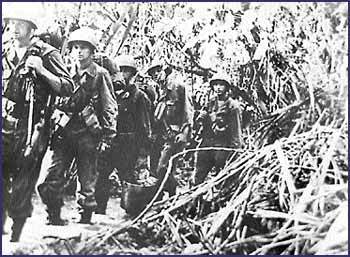 The 163rd Combat Team occupied positions in the jungle only a few yards from veteran Japanese soldiers along the Sanananda Trail. 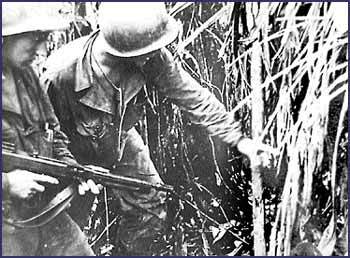 The soldiers from Montana endured constant sniper fire, short rations and tropical disease as they began to learn the art of jungle fighting. As much as 10 inches of rain fell in one night, and the soldiers often waded hip-deep in the water. The 163rd found itself facing the main Japanese force, several thousand men hidden in the dense jungle of the Sanananda Trail. In an engagement on Jan. 5, Company B, made up primarily of men from Poplar, lost eight dead and suffered three wounded, the first Montana men of the regiment killed in action. During the next three weeks of intense fighting the regiment lost 923 men, felled either by disease or Japanese bullets, but the last Japanese strongholds were eliminated one by one. After more training in Australia, the 163rd landed at Aitape on the northern coast of New Guinea, on April 22, 1944. Completely surprised, the 1,000-man Japanese garrison fled from the combined firepower of the destroyers and carriers just offshore. The troopers from Montana moved in and found food still cooking in Aitape village. The 163rd easily seized the airstrip, but the Japanese repeatedly tried to take it back. The malarial jungles of New Guinea proved nearly as deadly as the Japanese. The fiercest fighting of the Aitape operation came on April 27, 1944 when a platoon of men from Billings blocked the Japanese escape at Kamti and repulsed a bayonet charge by 200 Japanese coming in from three sides. They won a unit citation for extraordinary heroism. Only a few weeks after seizing the airfield at Aitape, the soldiers of the 163rd stormed Wakde Island, 450 miles to the west. Although Wakde was only two miles long and a mile wide, it contained 100 Japanese pill-boxes and bunkers, as well as 12 fortified caves which were invisible from the air. Hampered by intense heat and a tangle of blasted coconut trees, it took the 163rd two days of fierce fighting to clear the island. On May 31, 1944, two battalions of the 163rd were pulled out of the Wakde area and rushed to the island of Biak, where the other elements of the 41st Division had landed four days before. For the men of the 163rd, Biak was perhaps their fiercest battle of the war. The island held more than 11,000 veteran Japanese soldiers and Marines. The former National Guardsmen were met by heavy fire from Japanese airplanes, artillery, machine guns, and mortars. The fighting was often hand-to-hand, the terrain was inhospitable, and the water on the island was foul-tasting and nearly undrinkable. Most of the supplies which reached the front-line soldiers had to be packed up the steep ridges on the backs of weary soldiers. As the Americans captured the high coral ridges, the Japanese retreated to three underground strong points. The island of Biak was honeycombed with caves which the Japanese had thoroughly explored and improved upon. It took almost two months of vicious fighting before the Americans overwhelmed the final 1,000 Japanese holding the Ibdi Pocket. The 163rd Infantry was nearly worn out after several months of almost continuous fighting without replacements, but the men from Montana were part of the most decorated Army division in the Pacific, and were needed for the planned invasion of the Philippines. In February 1945, while other elements of the U.S. Army swept through the Philippine island of Luzon and captured Manila and Corregidor, the 163rd left Biak, bound for the Southern Philippines. The men of the 163rd Infantry had now spent three years overseas. While there were still many veterans from the old Montana National Guard left, their numbers had been diluted by the hundreds of replacements who had arrived after Sanananda, Aitape, Wakde, and Biak. On March 10, 1945, after the invasion beach was softened up by naval gunfire and a B-24 strike, they landed on the Zamboanga Peninsula of Mindanao, where they fought Japanese Marines for the next three weeks. In early April the regiment attacked the Japanese-held island of Jolo, in the Sulu Archipelago, halfway between the island of Borneo and the Philippines, where 2,600 Japanese waited. Three weeks of hard fighting ensued before the island was secured. The regiment spent the summer of 1945 mopping up south-central Mindanao, then resting and regrouping for the expected November landings on Kyushu, Japan. On Sept. 6, the Second Battalion of Montana’s 163rd Infantry landed at Hiro, Japan (near the flattened rubble of Hiroshima), where they were put to work destroying Japanese military equipment at the Kure Naval Base. The 163rd Infantry Regiment, like the rest of the 41st Division, was deactivated without fanfare at the end of 1945. The unit that had begun as the Montana National Guard contained barely 20 percent Montanans at the end of the war, more than five years after the Montana National Guard had been inducted. Fifty-nine Montanans died while serving with the 163rd Infantry Regiment during World War II. 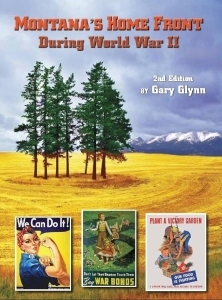 This article was originally published as part of the Missoulian’s Greatest Generation series in 2001.